The existing facilities provide all major services for repairs to the ships. 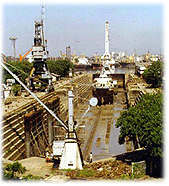 The Hughes Dry Dock pumps have been electrified and are used also for impounding water to an extra height of 1.20 m so that the depth of water at all berths inside Indira dock can be increased from 9.30 m to 10.50 m.
During fair weather seasons the depth of water level can be increased even upto 11.50 m. At Hughes Dry Dock 24 welding plants of 415 V - 80 V - 300 A capacity and 8 Oxy-Acetylene outlets have been provided. 100 lbs. per sq. inch 500 C.F.M. (i.e. two per dry dock). 4. Automatic fire fighting system. 5. Supply of salt water on one side of the dry docks. 6. Supply of fresh water on one side of the dry docks. 7. Supply of dry compressed air on one side of the dry docks. 8. Capstans at suitable location. 9. 6 Nos. water jet pumps. 10. 6 Nos. Girt blasting machines. 11. 10 Nos. spray painting machines. 12. 12 Nos. scaffolding sets. 13. Office Building at MDD East only. 14. Sub-station with frequency convertor and various supply voltage.